Near the end of 2015, Luis Fariñas del Cerro officially retired as directeur de recherche in the CNRS and became an Emeritus researcher of the CNRS. 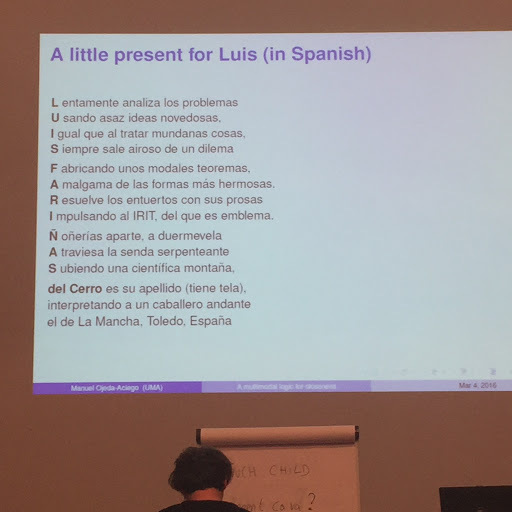 As a celebration of this event and tribute to Luis' brilliant career, a Festschrift meeting took place at IRIT, Université Paul Sabatier, Toulouse, on March 3-4, 2016. A Festschrift volume was edited in Luis' honour to celebrate his achievements in science, both as an outstanding scholar as well as a remarkable and highly successful organiser, administrator and leader in science and technology policy and management. The volume contains 15 scientific contributions by 21 authors, among them Luis’s colleagues, former students and friends. It also includes a short scientific biography, written by Philippe Balbiani and Andreas Herzig, that describes the many different areas of logic and computation where Luis has made significant advances to the field. Since Luis has been slowly winding down his administrative responsibilities, he has recently been able to dedicate a greater effort to research once again, entering with great enthusiasm new and exciting fields such as computational biology. Luis, we surely speak on behalf of all the contributors here to wish you enormous success and enjoyment in your new role and we look forward to many more years of inspiring cooperation with you in the future.